Friends? An Outernaut Needs No Friends. Not Anymore. 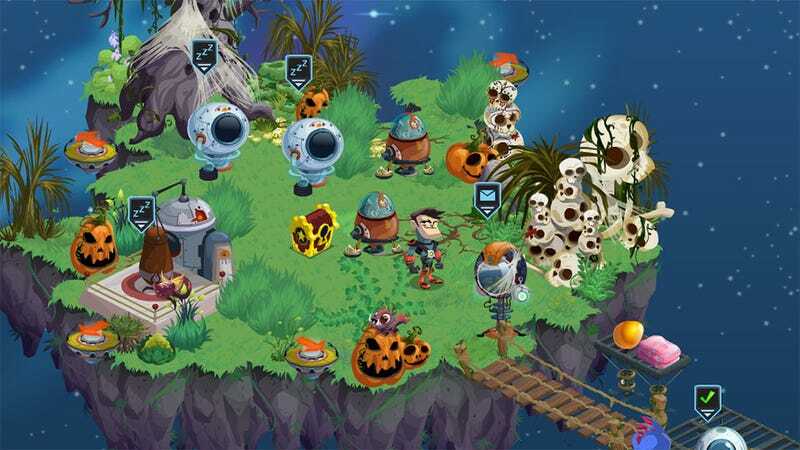 Players expecting something more than standard Facebook fare from the developer of Ratchet & Clank's first foray into the social gaming world were somewhat disappointed by Outernauts' strong reliance on things like asking friends for help or waiting for energy to refill. Yesterday's major game update should make those players a bit happier, with faster energy regen and an end to asking friends for stuff. Players returning to Outernauts today can expect a more challenging game with longer play sessions, things folks have been bugging developer Insomniac about since the game launched earlier this year. There are new beasts, new ways to modify beasts and more levels to gain. And let's not forget Halloween decorations. Here's the full list of changes. Is it enough to get you back into the game? - Crystals! – Crystals allow you to customize your beasts like never before. Alter your beasts' gem and metal type – or boost it up for some extra oomph in battle! Have a chance at getting Crystals by selling beasts or by picking them up in the Store! - Major Quest Revisions – We have overhauled many Outernauts quests to be more lax when it comes to requiring friends. For many quest, friends are no longer required, but optional. This allows Outernauts to accompany all play styles. - Max Energy Increase Item – A new item is now available for purchase that permanently increases your Energy. Yay! More battling! - New Beasts – Now eggs contain even more new, rare beasts for you to discover! - Max Level of Beasts is now 55 – Simple as that. Get training! - Halloween Decorations! – Feeling festive? So are we! Spooky themes decorations have been added throughout the world and in the store. Boo! But in a good way. - Dungeons are more Challenging – We saw the need to slightly increase the difficulty of Dungeons so that players could feel more challenged. Now when you beat them, you'll feel 107% more Pride! - New Dashboard – Give you all the latest Outernauts news in one place! - New Weekly Challenge – Want to win some Crystals? I think you do!